In this read, we’re going to talk about weaning from the pump when you’re an exclusive pumper. I’m sure you’ve heard the term “wean” when used to describe a baby gradually nursing less. For exclusive pumpers, weaning off the pump to produce less breast milk over time is a task that cannot be handled flippantly. 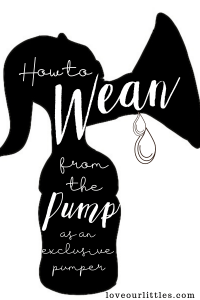 So keep reading, because I’ve got some great tips on how to wean from the pump safely and effectively! We have lots to go over on this topic, so let’s jump right in! Please stay until the end for extras goodies! Why do I need to wean from exclusively pumping? The reason you want to gradually reduce your pumping sessions while exclusively pumping is because it’s dangerous for your health to not do this task properly. I’m sure as an exclusive pumper you’ve been made well aware of the dreaded word mastitis. Which is a nasty infection caused by trapped breast milk that grows dangerous bacteria. How will you know if you have mastitis and what to do to prevent it. You can easily get mastitis when you stop pumping due to milk ducts not being evacuated regularly. This can also happen if you are not fully emptying your breasts at each pumping session. If you want tips and advice on how to empty your breasts fully when you pump, here is a separate article I wrote on that topic. Not only will fully emptying your breasts prevent infections, but it will also help to maintain and increase milk supply. Avoiding mastitis and over all discomfort is the best reason I can think of as to why you want to slowly wean from the pump verses quitting it cold turkey. When should I consider weaning from the pump? There are many reason why an exclusively pumping mom would choose to wean from the pump. Sometimes, you just need to stop for your own emotional health and that’s totally understandable, this #pumplife is not easy! But if you’re wondering when during your pumping journey it’s safe to start dropping pumps, here is good guideline to follow. 1-3 m.p.p. / 8-12 p.p.d. 4 m.p.p. / 6-8 p.p.d. 7-8 m.p.p. / 4 p.p.d. 9 m.p.p. / 4-3 p.p.d. 10 m.p.p. / 2 p.p.d. 12+ m.p.p. / 1 p.p.d. SAVE THIS CHART ON PINTEREST! The chart above is a helpful example on how often you should be pumping based on months postpartum. This graph is intended for those who are planning to continue to pump, but want to slowing decrease the number of pumping sessions without losing their milk supply. When do I drop a pumping session? I don’t know about you, but during my exclusively pumping process, I was counting down the days that I could drop a pumping session! Those first few months of pumping around the clock 8-12 times per day were the hardest – by far! A good indicator of when you can drop that first pumping session, is when your baby is sleeping though the night. Since exclusively pumping is the mimicking of a baby’s eating habits, you can take that cue from baby that your body will adjust accordingly. This first dropped session usually happens around month 4. That is when your baby’s tummy is big enough to hold the right amount of milk to keep her full throughout the night. Below you will be guided through the steps that I used to drop pumps and gradually be free from the pump all the together –Woohoo! If you’re not celebrating with me, you must really love pumping – and that would make you a very special person and I am envious of you! I wish I hadn’t of despised pumping as much as I did! Of course, there were good and bad days and overall, it wasn’t really that bad. I can say for certain though, that I don’t regret any of it! The first dropped session will be one of your middle of the night pumps at around month 4 when baby is sleeping through the night. Your body will adapt pretty nicely to this shift since it is a very natural course to take. However, not having baby wake to remind you to pump will make it a little harder to stay on your pumping schedule. The temptation to sleep all through the night with baby will be great! Tips to help you wake up to pump! Have something you look forward to doing while pumping, like watching a favorite show, reading or blogging! Keep a handy, little touch sensor night light next to you so you can quickly get some light in the room. Set a vibrating alarm on your smart watch. At this stage, you will still need to get in one middle of the night pumping session before you can fully wean from pumping at night. I recommend dropping the first middle of the night pump, and leave the second (early morning) one alone. This is because prolactin levels are usually elevated the most between these late night and early morning hours. You also do not want to wake at 6 or 7am and be painfully engorged. Here is what you need to do If you are ready to reduce the amount of pumping sessions per day, but are not willing to lose ounces. Take sunflower lechitin to help move milk out of sticky ducts better. Keep making those boobie bites and eating a milk promoting diet. Adding time to your pumping sessions is crucial when you are weaning down sessions and want to maintain your supply. It may seem to be a little counter-productive to the end goal of pumping less, but it is only necessary if you are worried about losing a signifiant amount of ounces. This course of action may require some trial and error. We’ve covered many different scenarios for ways to wean from the pump, now lets talk about how to quit pumping. For many reasons, it is the end of your exclusively pumping journey and you need to know how to go about finishing the process without pain and getting an infection. I can give you the tips that worked for me when I went off the pump, but just know, this was a process – it did not take place in a day. I worked up to weaning off the pump over a 3 month period before I stopped. I was also 10 months postpartum when I pumped for the last time. Just some things to consider before you implement these tips. Like I said earlier, this may be a trial and error process, so take it in stride and listen to your body. If something doesn’t feel right, reevaluate your strategy and do what’s best for your health. Reduce time on the pump at every pumping session. Go longer in between pumping sessions. Take an anti-histamine to help dry you up. Consume anti-galactagogues – what is a galactagogue? Cabbage leaves placed on the breasts can dry up breast milk. Eliminate a pumping session every 1-2 weeks after following the previous steps. This answer will be different for everyone, but I can speak for myself and what my experience was like. The biggest reason why I stopped pumping at 10 months postpartum (2 months shy of my goal) was mostly because I got my period back at 7 months postpartum. Boo! I was a little shocked and very disappointed when this happened, because I thought as long as I was pumping (4-5 pumps per day at the time) my period would not come back. Well, mother nature (as always) had her own plans. Unfortunately, no matter what I did to maintain my milk supply, it wasn’t a fair fight with determined hormones – they won. I was eventually only producing a quarter of what my baby needed per day. So, instead of forcing myself to pump through sore breasts from menstrual hormones and stuff my sad, deflated breasts into flanges that were now too big, I quit. The day came that I didn’t feel full, there were no more letdown signals and barely any milk was dribbling out when I tried to hand express. Breastfeeding and proud print and frame art! Works in 8×10 frames. Hopefully me sharing my story will help you better relate to what it may look like for you, when you begin weaning from the pump. The biggest tips I want you to take away from this read, is to always prioritize looking after your health and comfort first. Listen to your body, take things slow and be patient. Being in a hurry to quit pumping isn’t worth the risk of mastitis or losing your milk supply when you’re not ready to.